Carlos Boozer, center, of the Los Angeles Lakers goes up for a block against the Golden State Warriors on Nov. 16 at Staples Center in Los Angeles. After a college career that included winning the 2001 national championship with the Duke Blue Devils and appearances on the All-ACC first team and All-American third team, Carlos Boozer thought he’d be a first-round pick in the 2002 NBA draft. Mock drafts agreed, predicting the junior would go between 15th and 25th overall. Boozer said he “was making a list of the teams I couldn’t wait to play.” He cataloged which teams passed on him once, which passed on him twice. “I couldn’t wait to play Milwaukee [who drafted University of Tennessee power forward Marcus Haislip 13th].” But when he played them, he scored only four points in 23 minutes. It got better from there. By the end of the season, he earned second team All-Rookie honors. Boozer eventually made two All-Star teams, and among all players drafted in 2002, he is second only to Amar’e Stoudemire in career win-shares. The data, however, suggests Boozer’s success wasn’t due to the chip on his shoulder, just as the players picked ahead of him didn’t flame out because they had nothing to prove. After looking at 10 years of the first and second rounds of the NBA draft, we found little to no evidence that players who drop in the draft perform any better than players who were selected either near their expected draft location or before it. The chip-on-the-shoulder narrative might make for compelling copy, but it’s not much more than that. It’s more fable than facts. We categorized 480 players into three categories — Shoulder Chip players (fell in the draft compared to mock drafts’ expectations2); Team Darling players (picked before their expected slot); and Expectation players (drafted around their expected slot)3 — based on where they were drafted relative to where the mock drafts said they’d be drafted. Overall, 18 percent of players drafted between 2001 and 20104 ended up in the Shoulder Chip group, 16 percent in the Team Darling, with the remaining 65 percent of players in the Expectation cohort. It doesn’t. There are no obvious differences in eventual player performance based on draft category. 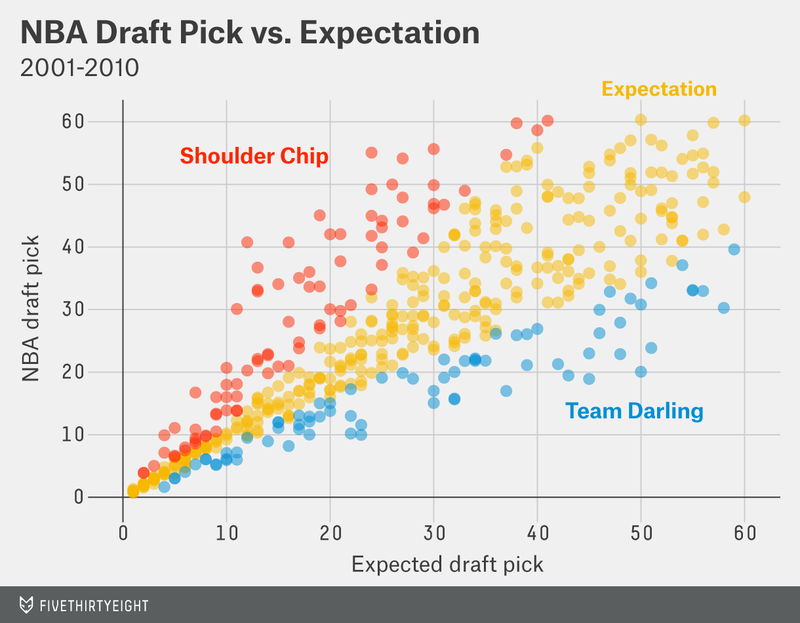 The curves for the Shoulder Chip and Team Darling groups are slightly to the right of players who were drafted at their expected slot, but the difference is not significant. 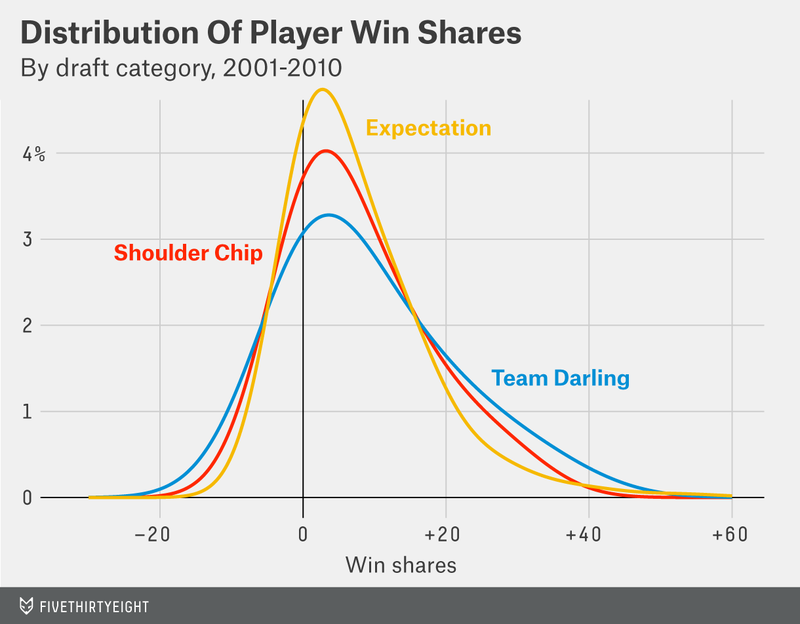 Simple enough, but for this analysis to hold up, we have to do more than just compare the overall distribution of player win-shares in the Shoulder Chip group to other players. After all, Chip players were, on average, picked later in the draft, meaning that this group is inherently devoid of surefire superstars and No. 1 picks like LeBron James, Dwight Howard and Derrick Rose. The easiest way to get around this is to compare players against others who were drafted in similar positions. We grouped players into one of five categories: Picks Nos. 1-5, 6-10, 11-20, 21-30, and 31 or above. 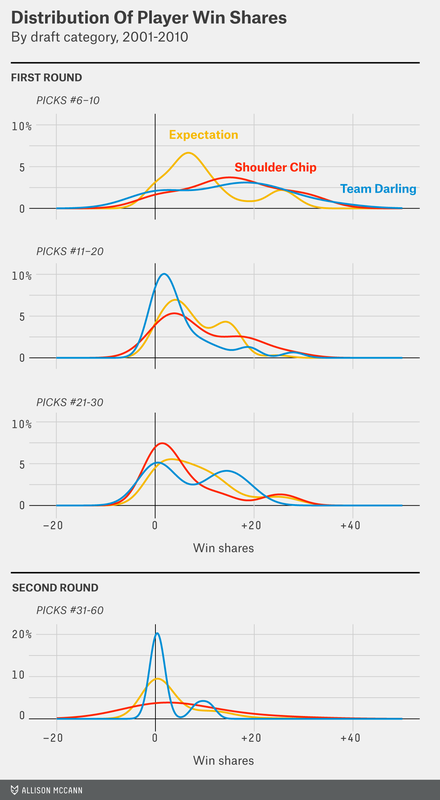 Within each group, there is once again little to no evidence that win shares can be attributed to differences in draft category. In most of the plots above, the Shoulder Chip group appears to fall at or below the other two categories in terms of future production. Looking at these charts and more formal statistical modeling7, it’s clear that it doesn’t matter where an NBA player is drafted relative to where he expected to be drafted. The guy’s going to play how he’s going to play, it seems. It is important to point out that these results, however, do not account for the possibility that Shoulder Chip players are more hit or miss than their counterparts. In many cases — such as Boozer’s and Sullinger’s — Shoulder Chip players fell because of injury concerns, and it would make sense that those types of players could provide the biggest risk for a team on draft day. It’s possible that the boom-or-bust phenomenon often associated with taking injured players or those who come with “baggage” is legitimate. General managers should still consider taking Shoulder Chip players, if only because they could be diamonds in the rough. A third of NBA second-rounders never play in the league, so players like Boozer may indeed offer the highest return on teams’ limited investments. You might get a dud, but you also might get a stud. Noah Davis, one of this article’s authors, also contributes to Grantland. We got our mock drafts from nbadraft.net. Given the nonlinear decrease in both contract value and eventual player success level for picks later in the draft, falling 10 picks in the first round is different from falling 10 picks in the second. We made the decision to group players who fell roughly two spots or more (from mock pick No. 5), five spots or more (from No. 20), and 10 spots or more (No. 30) within the Shoulder Chip group. Players drafted who were not listed on mock drafts were eliminated from the data set, leaving us with about 80 percent of all players taken during this time frame, including 97 percent of players taken in the first round. NBA win shares are a function of a player’s offensive and defensive statistics relative to his team’s point totals. As a result, our methods cannot account for the possibility that Boozer and other Shoulder Chip players help a team in ways that do not appear in a traditional box scores. Within each of the groups we are showing, there are at least 11 Shoulder Chip, Team Darling and Expectation players. We also used an ANOVA model of win shares as a function of the five draft slot categories and expected draft slot. Expected draft location was not a significant predictor in this model.